389 West River Rd Palatka, FL. | MLS# 953743 | Modern Realty of Putnam Inc. 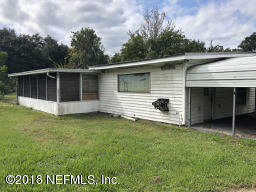 Single family home one block from St. Johns river. Easy commute to Orange Park. Home has formal living room as well las large enclosed porch. Included two tax parcels. Has detached workshop with guest house which is small one bedroom efficiency with bath. Lot is fenced.